The black bear was shot dead just inside the entrance to his den. 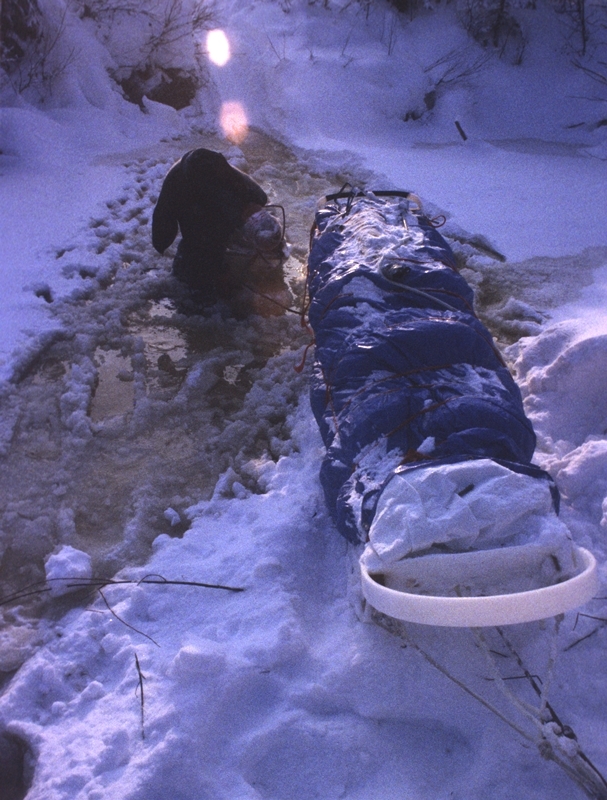 The Koyukon natives dragged the limp body from the dampness of the cave and went to work. They rolled the bear on its back and made an incision up the belly while peeling back the dark, matted hide. The hunting party was thrilled to discover six inches of glistening white fat layering the animal’s body. The bear was right. 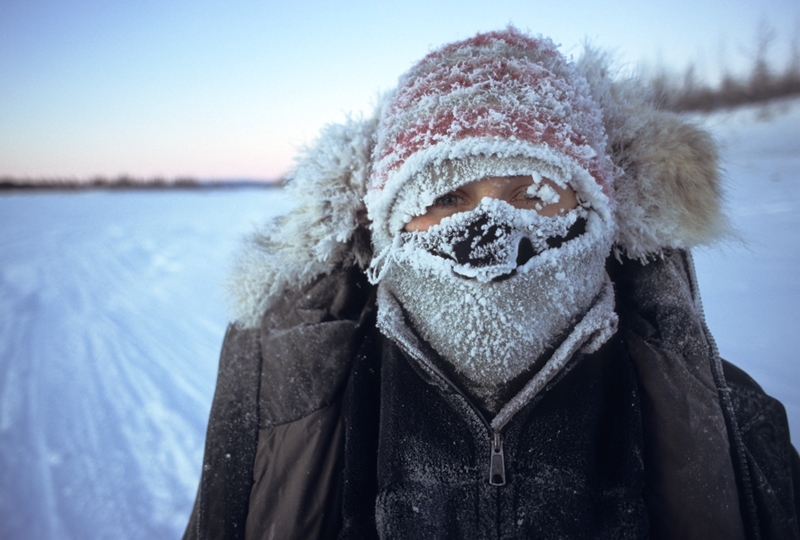 The Alaskan winter of 2006 proved to be one of the coldest in over a decade. In January, temperatures averaged some 15 to more than 20 degrees colder than normal for most of the state. It was already dipping to the 40 below mark when Sara and I departed the hub of Alaska’s northwest arctic: the village of Kotzebue. It was the first day of a journey that we envisioned would take us the length of the Brooks Range, 1000 miles in 100 days, all by the power of our 11 sled dogs. But as the sun set on that very first day we weren’t even near the mountains, or land for that matter, as we crossed the sea ice from the Baldwin Peninsula to the mainland. From space we might have resembled a speck of dust moving imperceptibly across a giant dinner plate. The sea ice in all its vastness was mute and the only sounds we heard were the quiet panting of dogs and the squeal of sled runners on ice. We traveled for five hours over the desolate, windswept terrain and darkness fell by the time we arrived at the delta of the Kobuk River. Locals told us there were trees within five miles of the river mouth. 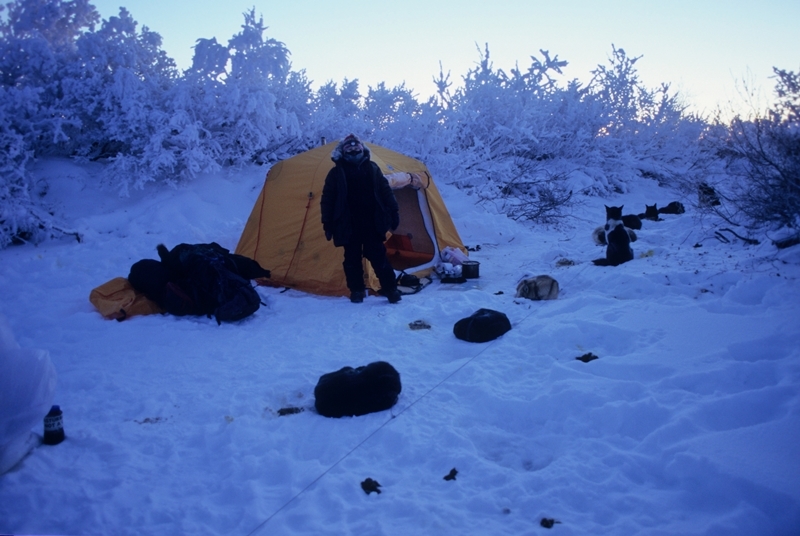 The trees were our goal as we needed them for fuel, to melt snow, heat the tent, and cook food for man and dog alike. We saw an abundance of willows. You can burn willows, dead ones, but with all the hoar frost encrusting them, it was impossible to tell the difference between the dead and the living. After 40 miles of travel we were exhausted and the dogs were beginning to fatigue. Sara’s entire face mask was plastered in ice from moisture frozen from her breath. She was unusually quiet; I could tell she was cold. The first day of any expedition is the hardest but after a week on the trail we had developed a routine. 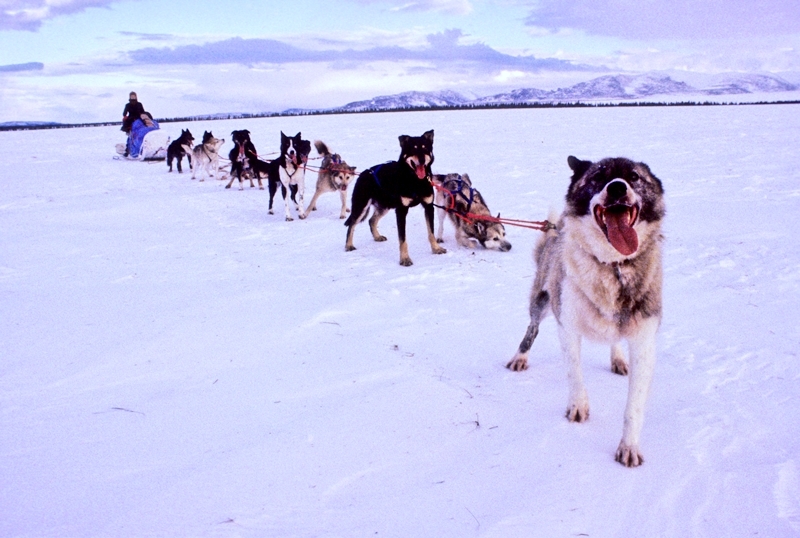 Animals like routine and sled dogs aren’t any different. We’d wake up and Sara would pack camp while I fed the dogs breakfast. After a couple hours on the trail, we stopped for lunch. Sara and I ate trail-mix or a half frozen candy bar and the dogs were given a dollop of fat or dried salmon. Then we’d continue till dusk, find our dead spruce trees before the sun set, eat again, have a fire, and heat the tent. It seemed as long as you kept the routine, whatever event may happen on the trail, the end result would be ok. But the weather was getting cold, dangerously cold. Their wasn’t a breath of wind and our thermometer hovered around the 50 below mark. For those who have never experienced extreme icy temperatures it’s hard to relate because people assume that cold… is cold. Think of it this way; at 50 below if the temperature rose 80 degrees- it would STILL be freezing. If you stop moving at 50 below, it’s almost impossible to keep warm. We decided that travel in -50F was just too dangerous and we weren’t going to attempt it again. However, our food stores were only going to last for so long. At some point we would need to travel, regardless of the temperature. Not only was the weather getting colder but the next leg of our journey was the most difficult. 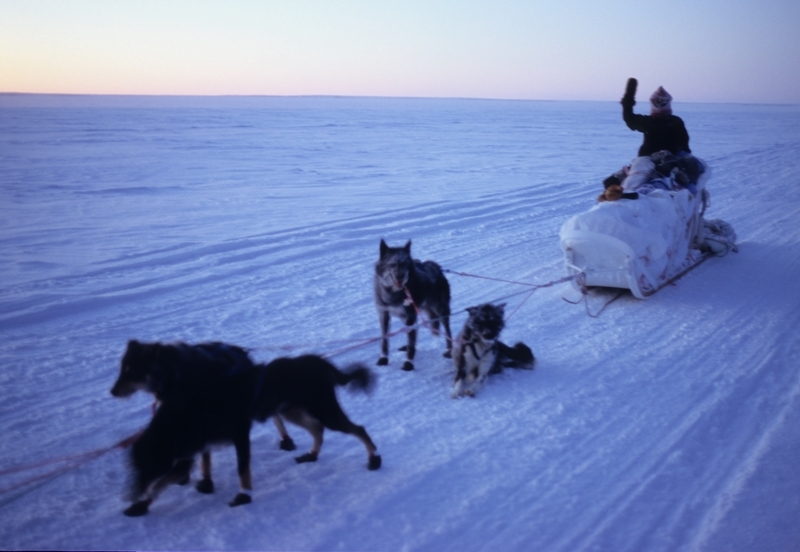 We planned to head up the Kobuk River and traverse overland via Norutak Lake to Bettles, a distance of 140 miles. This used to be a trading route between Inupiat Eskimos from the coast and Athabaskan Indians from the interior but it’s been abandoned for many years. Where we were going there would be no villages, no trails, and no rescue. Unbelievably, the temperatures dropped. The thermometer read -68F. Our food was running low and if we intended to get to Bettles it was now or never. I hoped the weather would break on the trail. But for Sara the cold was too much. It manifested into an emotional barrier she could not overcome. Sara had found her personal limits and I respected them. After much deliberation we arrived at the conclusion that she would fly out from the village of Shungnak and I would proceed up river alone with the dogs. Three days later, I mushed around a bend in the river when I glimpsed a wolf before it disappeared into the willows. I thought to myself, “Like a ghost.” I stopped the dogs and unsheathed my rifle. I had never heard of wolves attacking people, except in fictionalized Jack London stories, but wolves do attack and kill sled dogs for food. I was not about to let that happen. Not only were they my lifeline but they were also friends and partners in this adventure. A lone wolf howled behind a tangle of willows some 50 feet away, then more howling joined the chorus from perhaps a dozen other wolves. Across the river I heard more voices, which I first thought was an echo but then determined it to be other individuals. As the song continued the pitch heightened and a perfect harmonic cord was achieved, it was impossible to differentiate one voice from another. The howling stopped as abruptly as it began. We all listened intently, ears swiveling. But they were gone. 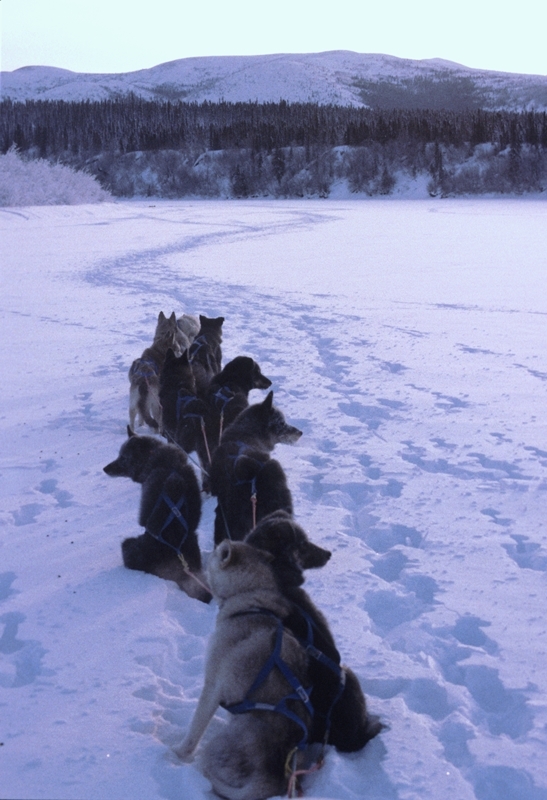 I gave the command, “Hup!” and the huskies leaned into their harnesses, instantly content with their work, as only sled dogs can be. We traveled up the middle of the river, which I didn’t like, because I didn’t know how thick the ice was. I trusted Wiley our leader to follow the caribou tracks. If the river-ice could support the weight of the caribou, I reasoned, it should be able to support ours. There were wolf tracks everywhere. Their paw prints were huge (twice as large as my huskies) and there were mighty ten-foot bounds between them. Suddenly, the dogs pulled harder; they smelled something up ahead and were interested in it. Ravens circled like buzzards overhead. As we grew near I could see the carcass. The caribou was dismembered and disemboweled. Clumps of hair and flesh had been torn and scattered, blood stained the snow a scarlet red. “This is why the wolves were howling.” I thought. “Perhaps trying to scare us off, or maybe, they were worried that their hard earned prize would be taken.” I pondered the idea of stealing some meat and giving it to my dogs who were obviously interested in it, but I didn’t. For some reason that didn’t seem fair, so I left it to the wolves. My face burned and the air smelled like ammonia. I peeked at the thermometer. 58 below. “Jesus, it has to get warmer!” The dogs were eating like crazy and I was thankful that Franky Jones had given us that extra whitefish. By the time we were ready to go, four hours had passed and I hadn’t even bootied the dogs. 11 dogs, four paws per dog, and in this cold it would take me about one hand-freezing-minute per boot. I’d rather stop every hour and pick the ice balls out from between their toes with my teeth. Everything was harder without Sara, I had twice as much work without her. I admit it, I took her for granted. The snow was getting deep but Wiley was doing an amazing job breaking trail. He tried to float on top of the snow, almost crawling across it, until he broke through- then he’d leap back to the surface and begin crawling again. The ten dogs behind him wallowed and swam through the bottomless powder. I felt a strong sense of pride watching those mutts work. It was almost as if they cared as much about the expedition as I did. I helped them along by keeping my weight off the runners, post-holing beside the sled, pulling and pushing as well. As the snow depth increased it became apparent that Bruce’s prediction had been correct- I would have to break trail for the dogs. The ‘easy’ way to do this is to set up a camp and leave the dogs behind while you snowshoe a path ahead, then return to the dogs and mush them up the trail you have created. The problem wasn’t the mileage- it was the wolves. Their trails crisscrossed the river and they howled at us periodically throughout the day. I feared that if I left the dogs alone, I’d return to find them all killed. 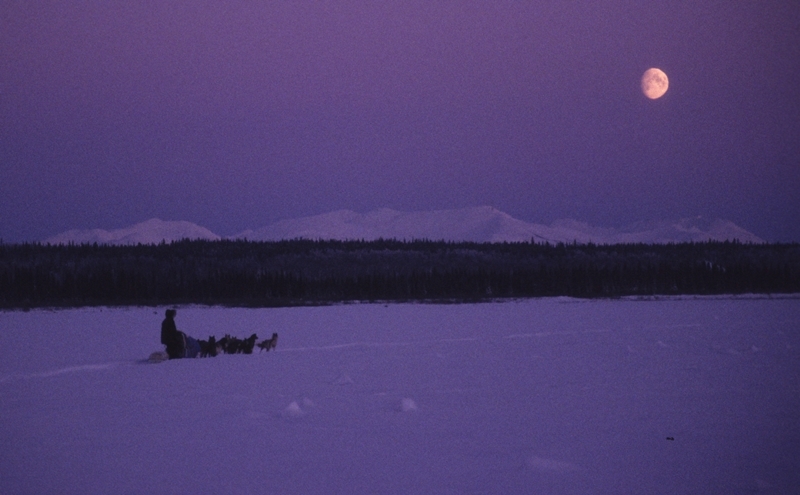 The thought of the dismembered caribou was a vivid reminder of what the wolves were capable. I sighed, pulled out the snowshoes from the sled-bag and fastened them to my boots. To me snowshoeing isn’t fun; it’s a necessity and downright hard work when the snow is deep. My plan was to snowshoe ahead while the dogs followed immediately behind. I really did have to trust them because they had the potential to run off without me, in the opposite direction with the sled and all its survival gear. I knew they wouldn’t do that though. They wanted to please, and they needed me as much as I needed them. A symbiotic relationship if I ever heard of one. I ran out in front of the dogs and snowshoed forward but they were faster than I was and caught up to me. I stopped them with the command, “Whoa!” I told them to “STAY” and then snowshoed ahead as fast as I could again. When I advanced 20 yards they’d proceed to chase till Wiley was standing on the back of my snowshoes. Then I’d whoa them and repeat the process. It was grueling work for me but they seemed to be having fun with it. At least we were all keeping warm. I found a good spot off the river and staked out the dogs. Tried starting a fire with my lighter but it was so cold the butane wouldn’t evaporate, rendering it useless. The matches were an afterthought but I was glad I had them. Wolves howled from the top of a small cliff directly behind camp and the sound startled me. They were too close to be afraid and I was sure they were following us. Their proximity made for a sleepless night. Whenever a dog got up to take a piss the jingle of his neckline would alert me and I’d sit up in the darkness and feel for the rifle, which was cold enough to literally burn my bare hands. I wondered if it would even fire. In the morning I rummaged through the sled bag looking for the days maps but I couldn’t find them. I realized with horrified certainty that they’d fallen off the sled miles back when I was breaking trail. Stupid mistakes like that get you killed in the arctic. I never considered going back to search for the maps because I was sure I’d never find them in the snow. Also, I didn’t want to put additional miles on the dogs if it wasn’t completely necessary. And in this case it wasn’t. I felt for the battery in my inside jacket pocket and quickly slid it into the satellite phone. The display lit up and I immediately dialed Sara’s number in Colorado. She was there slurping strawberry daiquiris, healing her frostbite in a hot tub. I told her my situation and gave her my coordinates which she plugged into a Mapping Program. Right there in Denver, Sara could see exactly where I was and what the river looked like ahead. She told me the river would begin to braid and if I chose the wrong meander, I would be going miles out of my way. I had her describe the topography in detail and I drew it in pencil on the back of a dog food bag. It would be my map for the next 15 miles. I was on the trail for a couple hours when I noticed the enveloping fog. It took me a moment to realize that it wasn’t fog at all- it was steam. It frightened me because I knew it could only be one thing. Super cooled air touching liquid water. You’d think at 50 below all water everywhere would be frozen solid, unfortunately this isn’t the case. When a river freezes all the way to the bottom, the water trickling through becomes damned. It must seep up through cracks and flow ON TOP of the ice. This phenomenon is called ‘overflow’ and is the dread of all winter travelers in the arctic. Overflow may be an inch deep to a few feet deep depending on the situation. Overflow is scary and it’s on the coldest days when it is most likely to occur, and then of course, is the most dangerous time to get wet. A wet foot at 50 below will be flash frozen the moment it is pulled out of the water. We made our way through the fog when Wiley spotted a depression in the snow that led to an inky black pool. He unexpectedly changed course and steered the entire team towards the water! I panicked and screamed, “NO, NO Wiley!” I ran for the sled and stomped on the break but it didn’t catch. He wasn’t going to stop, so in desperation I yelled the command, “Gee!” Wiley snapped out of his trance, immediately turning the team to the right and away from the water. I halted the dogs and proceeded to yell at Wiley with every obscenity I could think of. When I finished my tirade I began coughing uncontrollably. The heavy breathing had evidently frostbitten my lungs. I don’t know what goes through a dog’s mind, maybe Wiley was thirsty. I was frustrated to say the least. I pulled Wiley out of lead and replaced him with my old leader Ryan. Ryan wasn’t a hard worker like Wiley, but I was certain he had a bigger brain. The dogs were eating 20lbs of dog food a day and still getting skinny. We needed a resupply. I called Andy Greenblatt of Shadow Aviation in Fairbanks. 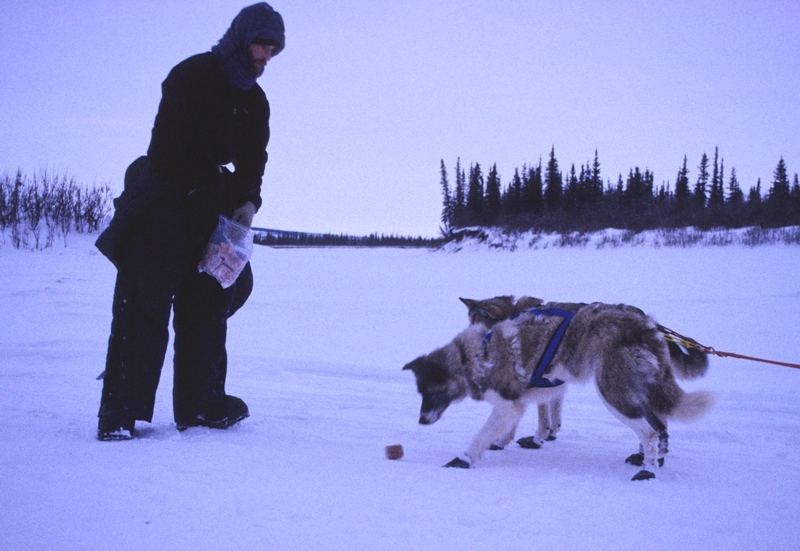 Before the trip I had arranged for him to drop me some dog food on Norutak Lake. Unfortunately, the FAA had grounded all flights due to the weather. I wasn’t getting a resupply anytime soon. At days end the temperature sunk to 53 below. The trees that flanked camp were black, drunken, and almost sinister looking. I scratched Wiley’s throat and made amends. It was good to have a friend in such a hostile place. As I petted Wiley, the river slowly illuminated an unearthly purple. The colors intensified till the snow itself appeared alive with some bioluminescent chemical. In the distance, the raw and jagged summits of the Angayucham Mountains radiated a florescent pink alpenglow. The sight didn’t last long. Upriver, a large curtain of steam lingered. It looked like a geyser had erupted. I had no desire to tiptoe my way through a mine field. As much as I wanted to accomplish the route, I didn’t want to die trying. The next morning I made the decision to turn around. Our trail was surprisingly easy to follow and we made it back to Shungnak in three days. Stephanie and Raymond Woods were kind enough to let me stay at their place for about a week. Unbelievably, Sara flew back in and when the weather warmed up we mushed our way south via the Hotsprings Route to Huslia. Eventually we made it all the way to Coldfoot on the Haul Road- but that’s another story. Above: My amazing leader Wiley. He passed away this year. I will miss him. Below: Sara and I on the left with teachers from Huslia. 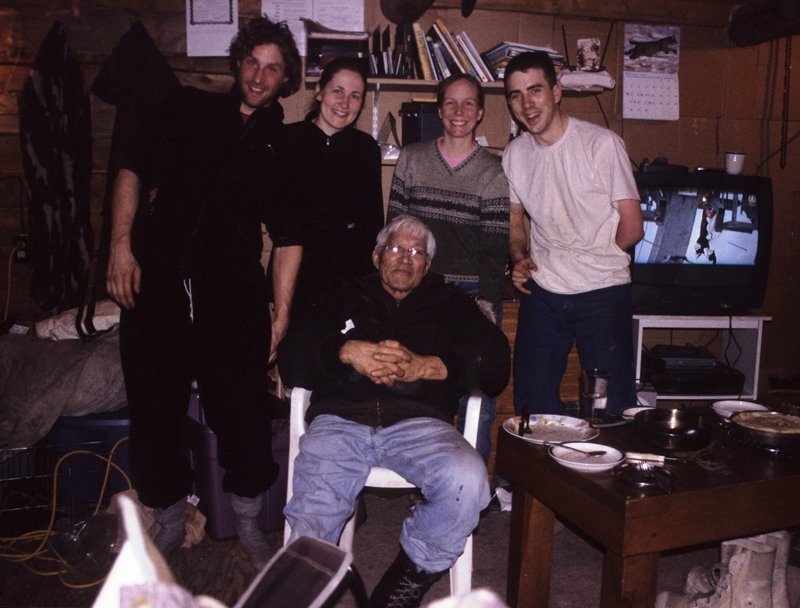 Mushing legend George Attla in foreground.